Ghosts tend to be associated with ancient castles and grand mansions – imposing old buildings which are far removed from the kind of place where most of us live.The story of the Enfield poltergeist demonstrates that the paranormal can emerge anywhere however even in semi-detached council houses in north London. Britain’s most famous poltergeist case occurred between 1977 and 1978. It affected the Hodgson family, and appeared to centre on the person of Janet Hodgson who was then 11 years old. The sequence of strange incidents began when Janet and her brother complained that their beds were moving around of their own accord. Their mother didn’t believe them until she saw a chest of drawers slide across the room on its own. She pushed it back; then it moved again and wouldn’t budge. By this time Mrs. Hodgson had become frightened and told her children to get out of the house. They ran to the neighbours’ house and the neighbours came back with them to have another look. All heard strange knocking sounds coming from various places in the house. Everyone agreed that something eerie and frightening was going on and the police were called. When the police arrived, they heard the knockings too but were unable to trace their source. From then on, bizarre happenings became routine in the Hodgson household. Objects would move around on their own and even the people in the house sometimes found themselves thrown around or levitated into the air. This was to become one of the most public hauntings in history. The Hodgsons contacted the media about what was happening to them. Journalists and photographers and paranormal researchers soon arrived and spent considerable time with the family. They themselves witnessed the same weird occurrences and recorded them on their camera equipment. Much of the equipment had trouble functioning in the strange environment of the Hodgson house. Batteries depleted very quickly, for example. Some fascinating images were captured, however. There are photographs of Janet Hodgson being flung through the air as well as objects floating around on their own. It seemed that whatever entity was responsible for the disturbances in the house was sentient in some form. The people in the house found they could communicate with it verbally and it would respond by making rapping sounds to indicate yes or no. At times, it even spoke through Janet’s body in a harsh, rasping masculine voice. It said its name was Bill and that it had lived in the house fifty years before. Most people who visited the Hodgson house became convinced that something very weird was going on. At least one researcher from the Society for Psychical Research, however, believed that fraud was being committed. She saw objects being flung around but thought the children were doing it when her back was turned. Moreover, at one point, the cameras which had been placed in Janet’s bedroom caught her bending spoons herself. When confronted about this, she claimed she was only doing it to test the researchers. Janet’s uncle was also sceptical, but most people who looked into the phenomenon became convinced that it was real. That Janet was the source of the activity there can be little doubt. When she spent some time away from the house to undergo medical examination, all trace of the poltergeist activity disappeared. After about a year and half, the activity ceased entirely of its own accord. 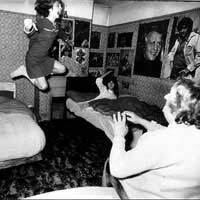 Because of its very public nature; and because journalists, photographers and researchers were all invited to come and witness the phenomenon for themselves, the case of the Enfield poltergeist remains one of the most compelling within the paranormal literature. 'nanatrish' - Hitchin is a really old town. I know it well and Sun Street where you stayed is hundreds of years old. That building has reputation for being haunted as do a number of other buildings in Hitchin. I'd love to see those photos. I live right by it I know the house very well ?????????????? I recently stayed at the Bella Vita in Hitchen England,while trying to take photos of the room i found that every image featuring the four poster bed contained misty images yet photos taken of the rest of the room were clear ! Does this hotel have a history? My family and I lived in a haunted property called 'Gladstone villa' in the former mining town of Bargoed in the South Wales valley's during the 1970's and we experienced phenomena very similar theEnfield poltergeist that simply defied rational explanation, we would regularly hear noises like footsteps in the bedroom when we would all be downstairs watching TV, when we would go upstairs to investigate we could find nothing that could be accounted for it. we had a priest to bless the house and also a medium who confirmed that there was indeed a presence in the house and said it was an earth bound spirit. My mother also saw the ghost eventually, it was figure of a monk. We had the ghost for so long that my grandmother called it 'Johnny' We had some miner poltergeist activity but we came to no harm. We left Gladstone villa in the summer of 1978. What I have said here is the truth and I wouldn't say this if I couldn't possibly back it up! The place was converted into a hotel and is now called 'Redz parc hotel' and the staff has said to have had experiences there, and something about room 5. I think the voices were put on by the girls but of course as with everyone else I can't really prove this. I also believe that most of the phenomena was actually genuine as I have had experiences of my own with the paranormal in Wales during most of the 1970's, and the Enfield poltergeist is similar to my own encounters. What is the specific location for the enfield poltergeist house? We had a poltergeist on site for years, got on well with the staff, then it moved to another part of the building and kept us entertained. Then things got out of hand, we seriously annoyed it one night, it chased us off, trashed the place and left. Wouldn't of missed for the world, and if I never meet another one even better.